The Banded Rock Rattlesnake is a pretty species, usually living at higher altitudes in dry, rocky areas. Its highly variable diet includes rodents, lizards, small snakes, some amphibians and large insects. The young Banded Rock Rattlesnakes have bright yellow tail tips, which may serve to lure lizards, which are its primary diet. 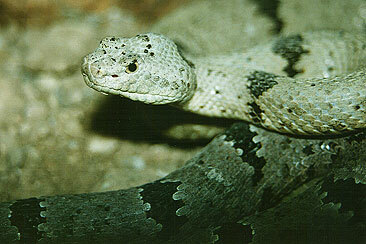 Its scientific name honors Laurence Klauber, an American authority on rattlesnakes. Klauber's two volume set, Rattlesnakes, is the definitive study on the subject. An abridged edition is also available. The Banded Rock Rattlesnake is found in western and central Mexico, north to central New Mexico and southeastern Arizona. It rarely exceeds two feet in length.